Make classic Italian eggplant parmesan at home quick enough for a weeknight, and better for you too, with sheet pan eggplant parmesan and homemade turkey meatballs. 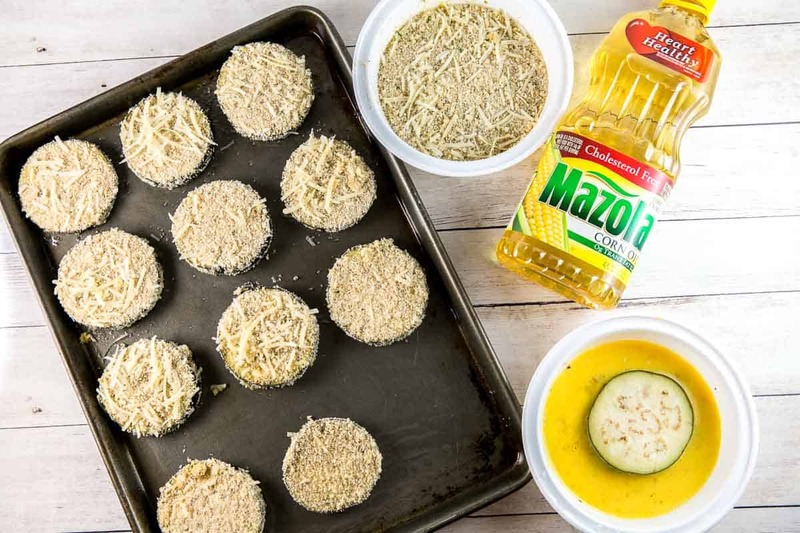 Skip the frying and bake with Mazola® Corn Oil instead. In fact, did you know a recent study has found that adding Mazola® Corn Oil to one’s diet resulted in lower cholesterol levels than Coconut Oil. A previous study found that corn oil can also help lower cholesterol more than extra virgin olive oil. To learn more about the study, see Mazola.com. Growing up, eggplant parmesan was probably my favorite thing to order from Italian restaurants. I was a vegetarian for 15 years, and I’ve never been a huge fan of tomato-based sauces, so my choices were a little limited. But a big slice of eggplant, battered and fried, covered in cheese, and served with a side of pasta? Yes, please! And then I became an adult and became a little more conscientious about my eating. 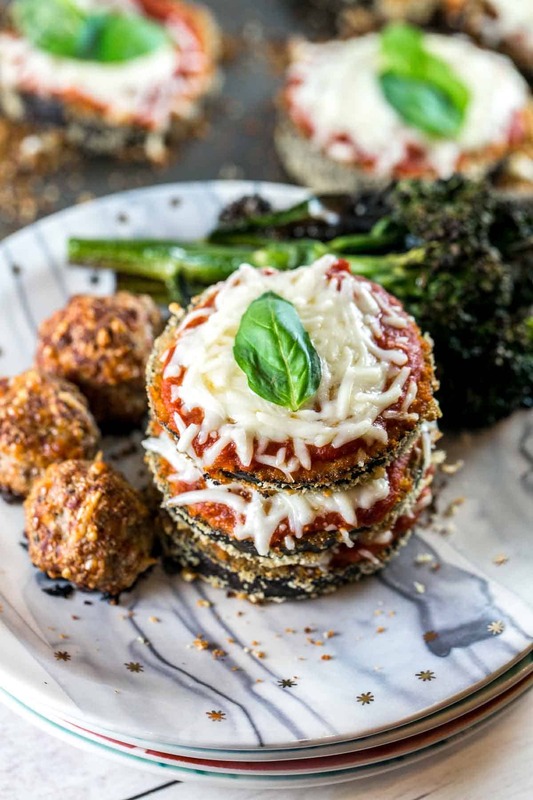 Fortunately, eating healthier doesn’t mean we have to sacrifice flavor, like with this sheet pan eggplant parmesan! Skip frying the eggplant and bake it instead. Serve with a side of turkey meatballs instead of higher fat beef or pork meatballs. Bypass the pasta and go for some roasted vegetables. And skip the heavier oils in favor of Mazola® Corn Oil. We’re still using some oil in this recipe, to help get a nice crispy coating on the (baked, not fried!) breading (and to ensure the eggplant doesn’t stick to the pan!). I like using Mazola® Corn Oil because it’s a smart, heart-healthy choice made of 100% pure oil with no additives. A clinical study showed Mazola Corn Oil reduces cholesterol 2x more than extra virgin olive oil. To learn more about this claim, see Mazola.com. 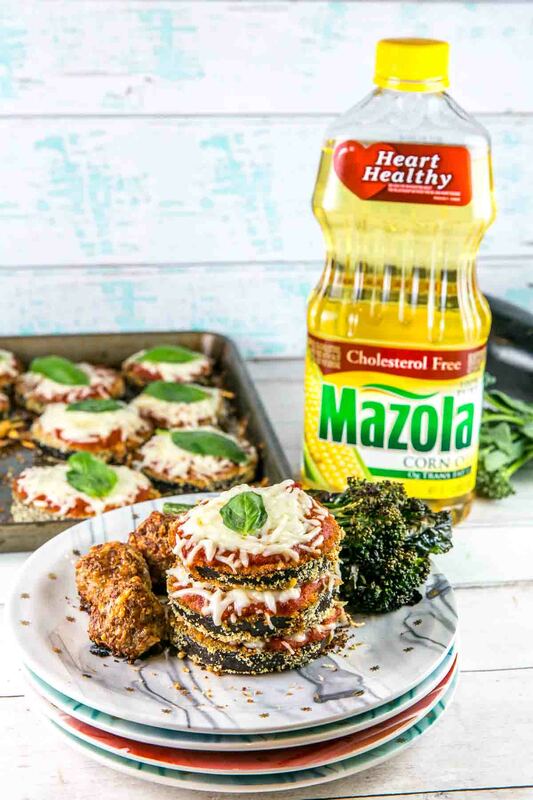 Mazola® Corn Oil has a neutral taste, so the eggplant actually tastes like eggplant. Plus, it has a higher smoke point than most other cooking oils (450°F!) so you won’t set off your smoke alarm baking your sheet pan eggplant parmesan or sacrifice the nutrition from the vegetables. Many home cooks don’t know that all cooking oils have a high smoke point that, once exceeded, not only negatively affects the food’s flavor but also affects the nutritional value. One thing you might notice missing compared to other recipes: I don’t bother with salting my eggplant. Coating sliced eggplant with salt, then rinsing off after 20-30 minutes, can help remove any bitter taste by drawing out any excess liquid. You can absolutely do this if you prefer. Using smaller, fresh eggplant also reduces any bitter taste or sogginess, and saves you the extra time. I’ve talked before about my love of sheet pan dinners (like this sheet pan Asian salmon) and how you can prep everything ahead of time. This eggplant parm is exactly the same: you can dredge the eggplant and roll the meatballs in the morning before work, and then bake when you get home. You could make this even easier by using store bought turkey meatballs, but it only takes about 10 minutes to make your own from scratch. Extra bonus: you know exactly what goes in them (and my 2.5 year old devoured these)! 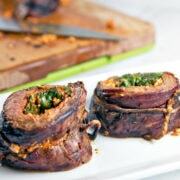 Delicious, better for you, and weeknight friendly – the dinner trifecta! Make classic Italian eggplant parmesan at home quick enough for a weeknight, and healthier too, with sheet pan eggplant parmesan and homemade turkey meatballs. Preheat oven to 375 °F. 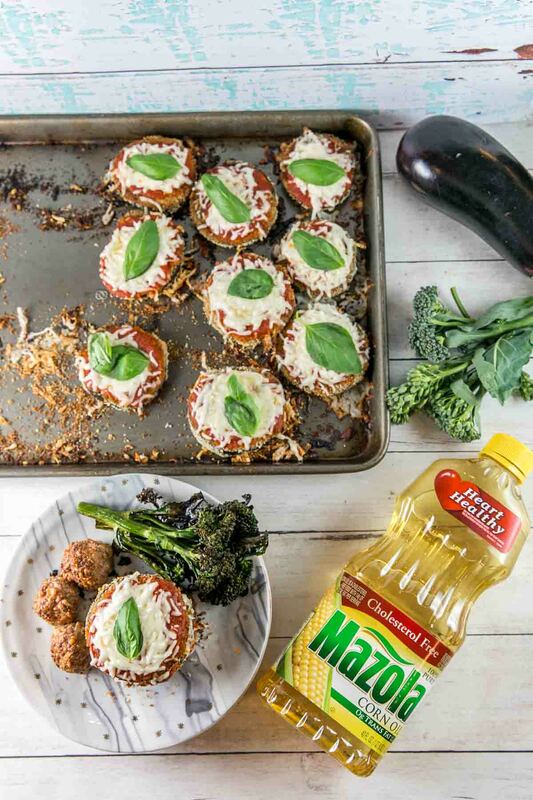 Drizzle the Mazola® Corn Oil over the sheet pan and spread to cover the whole pan. Combine the panko, parmesan cheese, oregano, basil, garlic powder, and salt in a shallow dish and mix. In a separate dish, whisk the eggs. Dip the eggplant slices in the eggs, followed by the panko mixture, turning to coat both sides. Place the breaded eggplant slices on the sheet pan. Bake for 15 minutes, flip, and bake an additional 15 minutes. Spoon tomato sauce over each slice and top with the shredded mozzarella. Return to the oven and bake an additional 10-15 minutes, until cheese is fully melted. 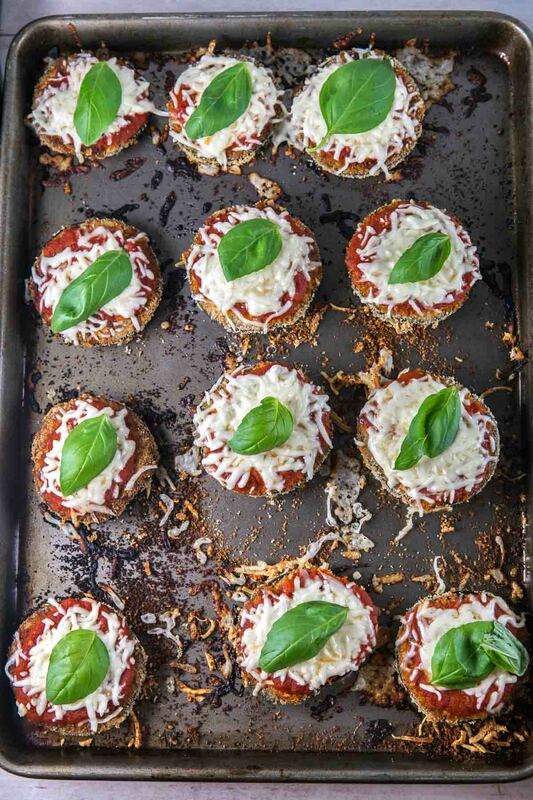 Remove from the oven and top with fresh basil. While the eggplant is baking for the first 15 minutes, prepare the turkey meatballs. Coat a second sheet pan with theMazola® Corn Oil. 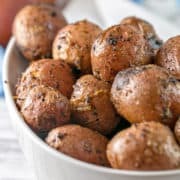 Combine all other ingredients for the turkey meatballs in a large bowl and mix together, using your hands, until the ingredients are just combined (do not overmix). 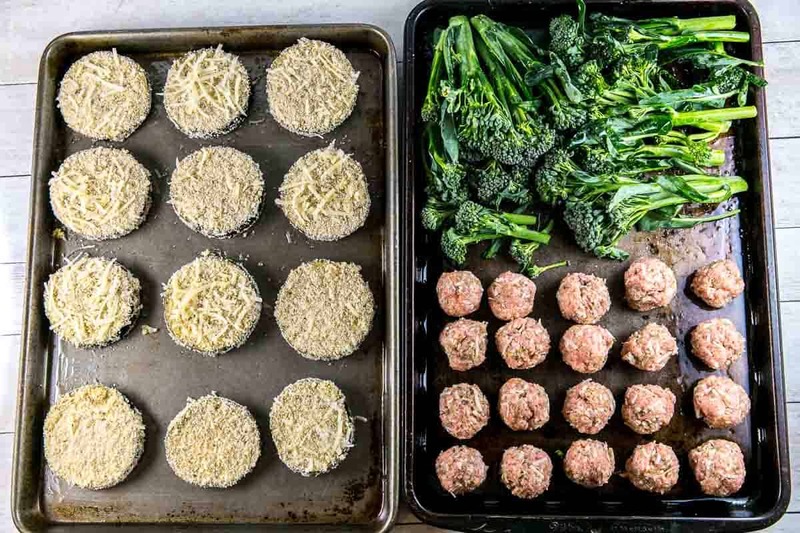 Using your hands, roll into golf ball-sized meatballs and place on the sheet pan. Add the sheet pan to the oven after flipping the eggplant and bake for 20-25 minutes, until reaching an internal temperature of 165 °F. This looks really delicious dinner option! I can’t wait to try your recipe! 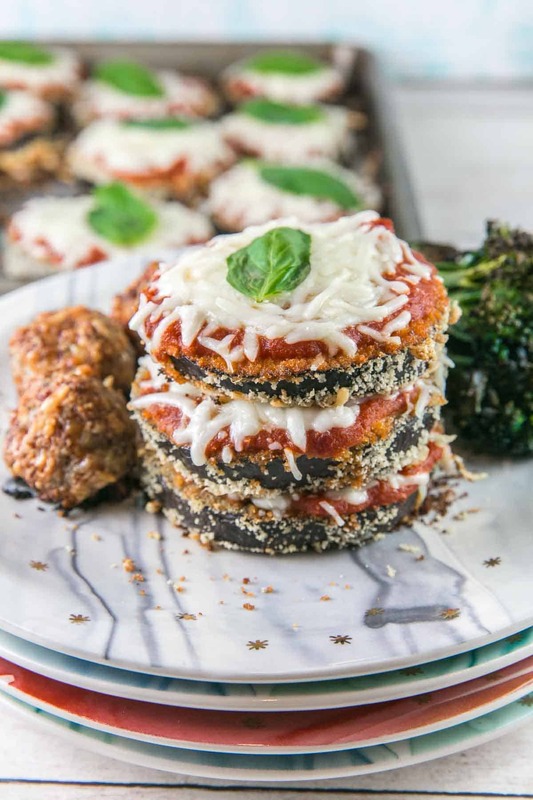 I have actually never had eggplant Parmesan before, but your recipe looks outstanding! I definitely want to dive into this sheet pan! Eggplant Parmesan has always been a favorite of mine. Haven’t had any in a while but this is making me want some now. Going give this a try! Love this idea! Seems so much easier than pan-frying the eggplant parm. Definitely adding this to my weeknight rotation. This is genius. I LOVE sheet pan meals. They make life so much easier! 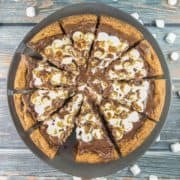 Definitely going to test drive this recipe ASAP – I have a feeling I’m gonna love it. Eggplant parmesan is one of my favorites! I love this healthier spin! 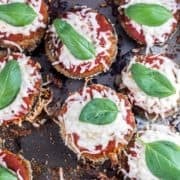 I’ve always wanted to try eggplant parmesan, your recipe looks delicious ! I know what I’m making for dinner next ! I love eggplant but I’ve never made eggplant fritters. I love savory veggies cakes so this would be a great vegetarian weeknight meal idea. This looks really reallllly good…I’m a huge fan of eggplant. I’ll definitely give this one a try! This sounds so good, I’ll have to give it a try soon. I love all the flavors in this! 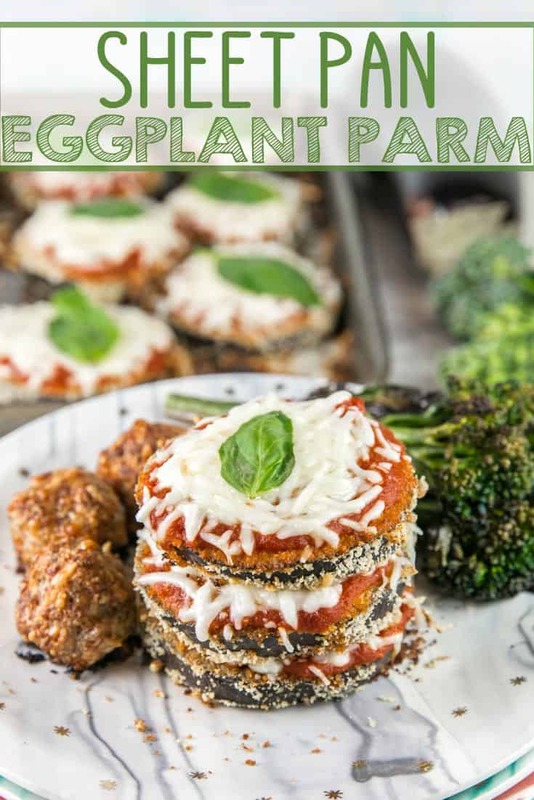 I love eggplant parmesan SO much and this sheet pan version looks amazing!! Can’t wait to try! This looks awesome!! I have never actually seen eggplant parmesan in restaurants, but I am surprised that you liked it growing up. Most kids HATE eggplant. I know I did!